Well, what have I done today, not much really. My son was a bit jealous that I had a website and a blog, that I have had to show him how to set one up too! He is currently trying to work out the design for his website, and I told him I would help him to start his blog, once he understands the web pages first! He is now researching about what he can write about. He loves sport, so he thinks that this will be his main subject, he is only 12. I love reading the website http://www.allfreesewing.com/ and gaining new ideas about what I could make. I recently joined their list on the facebook site, and sent in a picture of one of my projects. They said they would be featuring it in their newsletter next week, I was so excited, can't wait to see it. 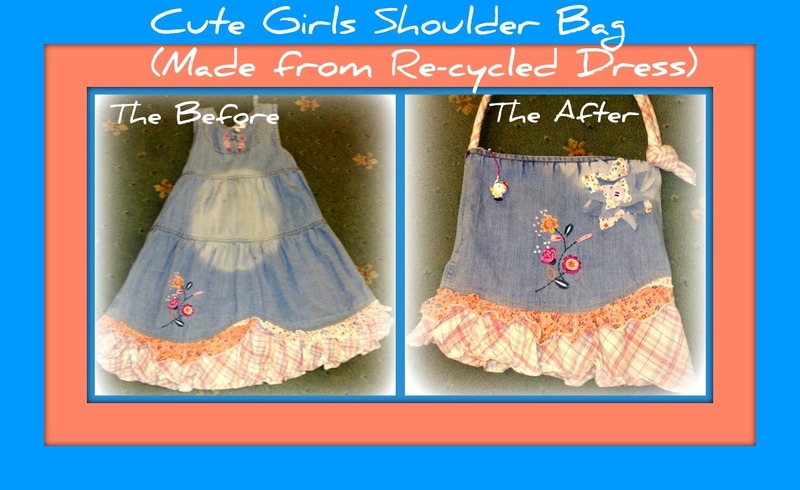 It was the one where I changed my eldest daughter's outgrown dress into a trendy looking shoulder bag. I will attempt to post a picture here, hope it works. It was a denim dress with a nice fancy frill. I unpicked the dress at the seams and cut the length I needed. I sewed the denim and some spare material (for lining) I had, into pocket shapes. 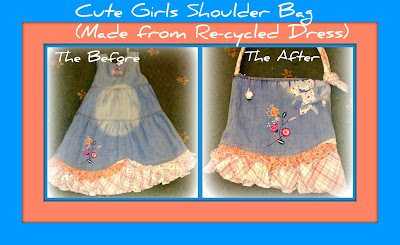 (I added a pocket to the inside of the bag, with the denim from the front part of the dress.) Then I placed the lining bag into the denim bag, then I sewed them together at the top. I used the original bias tape from the dress to go all the way around the top of the bag. Then I used the spare frill to make a handle (i used some filling to bulk it up). I made a material flower with the frill and denim and added a button and sewed this to the front. I then decided afterwards that i would prefer a zip fastening (originally I was going to put a press stud). This didn't take me long and I finished it in one night. My daughter loves her new bag and can keep her things nice and safe too!